MANILA, Philippines (Released) - The June 2018 Fire Officer Exam and Penology Officer Exam results (FOE-POE) as well as the complete list of passers will be accessed at this website as the Civil Service Commission (CSC) officially released the results online within 41 days after the exams. Below is the summary of Fire Officer Exam result for June 2018 and Penology Officer exams list of passers (FOE-POE), courtesy of CSC. The FOE-POE exams 2018 are administered by the Civil Service Commission on June 24, 2018 at designated CSC testing centers nationwide (San Fernando City, La Union; Tuguegarao City; City of San Fernando, Pampanga; Batangas City; Legazpi City; Iloilo City; Cebu City; Tacloban City; Zamboanga City; Cagayan de Oro City; Davao City; Cotabato City; NCR - Quezon City; CAR - Baguio City and CARAGA - Butuan City. The June 2018 FOE-POE exams were originally scheduled to take place on June 17, 2018 but later rescheduled June 24 through CSC Examination Advisory No. 11, s. 2018 to ensure the efficient and timely discharge of preparatory and administrative requirements on the conduct of the the aforementioned exams. CSC also considered the observance of upcoming holidays dated June 12, 2018 - Independence day and June 15, 2018 Eid'l Fitr or end of Ramadan. The exams aim to establish a register of Eligibles (RoE) in which the certification can be used to second level ranks at the Bureau of Fire Protection (BFP) for FOE and Bureau of Jail Management and Penology (BJMP) for POE, provided that the eligibles meet the requirements and qualifications of the position. The resulting Fire Officer Eligibility and the Penology Officer Eligibility are both second level eligibilities that are specific and appropriate for second level ranks in the fire protection and jail management and penology services, respectively, and other functionally related services. These eligibilities, however, are not appropriate for ranks under the Philippine National Police. As stated in CSC Examination Announcement No. 03 series of 2018, the target release of June 2018 Fire Officer Exam (FOE-POE) will be within forty-one (41) days after the day of exams (on or before August 4, 2018). The most recent FOE-POE exams were conducted by the Civil Service Commission on March 13, 2016. A total of 1,317 out of 8,031 (16.40%) examinees passed the FOE exams while 207 out of 1,241 examinees hurdled the POE exams. Edgardo Siguan from NCR ranked first in the Fire Officer Exams garnering a rating of 91.49% followed by Dan Romulo Caceres also from NCR having 90.57%. In the Penology Officer exams, Allyne Stephanie Caceres from NCR, Madelyn Mas and Ma. Liezl Rosales, both from Eastern Visayas topped the exams having 88.49%. For 2017, there were no conduct of FOE and POE exams. FOE and POE covered 150 test items and 10 Examinee Descriptive Questionnaires (EDQ) in 3 hours and 5 minutes. To pass the exams, CSC said that an examinee must obtain a general rating of at least 80.00%. 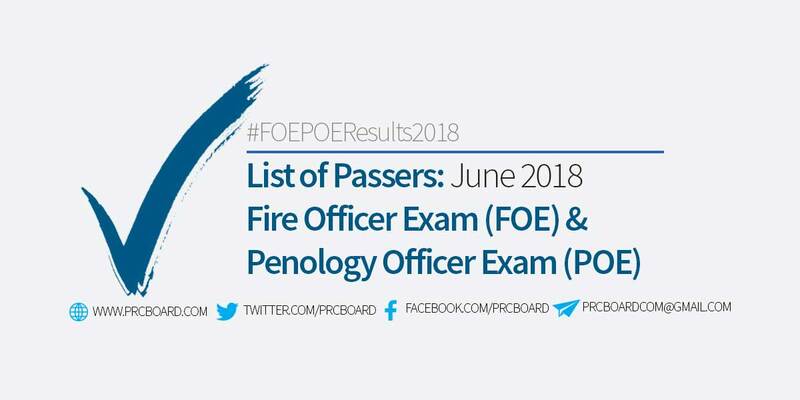 To receive up-to-date news about June 2018 Fire Officer Exams and Penology Officer Exams (FOE-POE) result, we advise our visitors to bookmark this page, visit PRC official website, follow us at our social media pages via Facebook and Twitter or join the members discussions at our Facebook Group. Kung nkapasa ba sa napolcom pwdy pa bang mag.exam sa fire officer? Pwede sir, magkaiba po yun na Eligibility at purpose ng Eligibility. NAPOLCOM Entrance Exam is special Eligibility for applying to PNP while FOE is 2nd Level Eligibility for applying to BFP. Both is not transferable meaning, di mo pwdeng gamitin ang NAPOLCOM Eligibility para mag-apply sa BFP or vice versa. wala talagang passer sa ARMM sa FOE at POE? Congratulations Sir Jeff Naparato ng Proscenium Phase 2!! Sir, rating will be available by August 15, 2018 as per CSC Examination Advisory # 20 Series 2018. Kindly elaborate nga po ang "2nd level eligibility"? Sir/madam makukuha po ba natin ung CoE sa malapit na CSC office? Ask q lng pg ngaaply k ng entrance exam for fo1 ung age limit is 35,pro nung ngsearch aq sa recruitment ng fo1 bat hanggang 30 lng po,pwd p po b mgapply kpg 33 if age n? After passing the exam for FOE ano po ang next step na gagawin? Sir kelan po pwedeng kumuha ng CoE ? Gud am po mam/sir, klan po ang specific date ng releasing ng certificate of eligibility for Foe passers 2018 for region 9?